Written by Peter Conrad I’m enjoying a great Costa Rica travel vacations so far. I’ve been to the Caribbean coast, had a Costa Ricavolcano tour in the mountains across the country, the rain forest, the cloud forest, dry forest, and beautiful beaches and spots in the North Pacific. It’s incredible, a small country with so many things to see and activities to do. If you are wondering about what to do in Costa Rica, just follow my Journal. 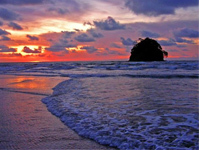 It’s plenty of great adventures of this Costa Rica eco tour. I’m currently in Guanacaste, in the North Pacific Coast. There’s great weather here, a bit hot but dry and with no rains. Some of the unforgettable places that I’ve been to, are Playas del Coco, Nosara, Ostional, Rincon de la Vieja Volcano National Park, and Santa Rosa National Park. I’m staying at Flamingo Beach, a beautiful beach 50 miles southwest from Liberia, since it allows me to go to many places in short distance. You can get to Flamingo by driving, bus or taxi, either from San José, or from Liberia and its International airport. One of the neighbor beaches is Brasilito. It’s in a small fishing town located in the Brasilito Bay, five minutes from Flamingo. Very much like Potrero, this is a very traditional Tico place, and it’s very quiet, unlike crowded Flamingo. Brasilito is the place to go if you are coming in a Costa Rica budget vacation. There are few Hotels here, but chances are, you will find an accessible place to stay. Not just accommodation is cheap, but also transportation. You will also find restaurants, bars and café Internet. If you look for things to do, there are rental shops for horse back riding, dive equipment, biking, motorbikes and other more activities. The Beach is beautiful, just like the rest of the beaches in this part of Guanacaste. There’s sun for 11 hours a day, especially during the dry Season. The water is warm and calmed. If you want to enjoy a great Costa Rica discount travel, check Brasilito.